Proposed I-69 Corridor Studies, Indiana — EcoAnalysts, Inc. The Indiana Department of Transportation and the Federal Highway Administration proposed an Interstate - 69 extension from Indianapolis, Indiana to Interstate 64 near Evansville, Indiana. The extension was portioned into six sections and EcoAnalysts participated as ecological consultants on Sections 2 (Gibson and Pike Counties, Indiana) and 5 (Monroe and Morgan Counties, Indiana). As part of the environmental review for this project, EcoAnalysts surveyed several streams within the construction corridors of Sections 2 and 5 for fish, crayfish, and unionids (freshwater mussels). In addition to the biological aspect of the stream and river surveys, habitat evaluations were also conducted. Biologists participating on this project received additional training by the client in conjunction with Indiana Department of Environmental Management (IDEM) for habitat assessments. This training supplemented our staffs’ already vast experience conducting evaluations using the U.S. Environmental Protection Agency’s Rapid Bioassessment Protocol for Non-Wadeable Streams (EPA-RBP), the Department of Agricultures’ Steam Visual Assessment Protocol (SVAP), IDEMs’ Qualitative and Headwater Habitat Evaluation Indexes (QHEI and HHEI). EcoAnalysts’ primary responsibilities as team members for the proposed I-69 extension project were to characterize the habitat and aquatic communities in rivers and streams within the corridor. Field studies focused on fish unionid (freshwater mussel), and crayfish communities within the project corridor. We additionally provided mitigation options for potential impacts of construction activities to unionid and fish communities, and were the liaison between the client and state and federal resource agencies. Streams varied in size from headwater to large riverine systems. The fish communities were sampled using backpack, tote barge, and boat electrofishing, and followed state protocols. The Index of Biotic Integrity (IBI) for the eastern Corn Belt region of Indiana was used to assess the fish community within streams in the project corridor. Additionally, state listed species such as the eastern sand darter and blue sucker were targeted during surveys. 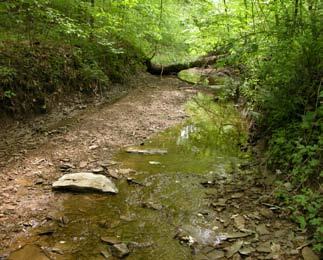 Streams were surveyed for state and federally listed unionid species and the overall community composition. Habitat within each stream and river was also determined and followed the IDEM QHEI and HHEI protocol. Clients received technical documentation and reporting of our findings that included historical information of the study sites (past survey information), methodologies, mapping, and mitigation suggestions.